Is there any excuse for Koodo sending me texts in the middle of the night? Last night, Koodo sent me a text message at 1:40 AM saying "Heads up, your eBill is ready." People sleep at night and this is just really poor business practice. Well, is it always like that? My reminder texts came either early morning or late afternoon. If you don't want to hear anything, I would suggest you put it on "Do not disturbed" mode at night. Mine never came in as late. But there's DND for that. This was an issue a few years ago, but Koodo cleaned up their act. Text message delivery can be temporarily delayed if your phone is out of network range for whatever reason. Once the handset reconnects to the network, the backlog is automatically relayed. Putting it on do not disturb is not an option - alerts and family use text and phone. If it was for recreational use, no problem. The last text came in at 1:40 AM on Sunday night / Monday morning. I put this out there as a way for Koodo to better understand its customers. I have been a Koodo customer for several years. It's not always like this. Usually, it is afternoon. Why text me to say it being emailed? No other company texts me to say they're sending me a bill. It's not that exciting news! On prepaid I always get those texts in the middle of the night too - complained about it for as long as prepaid has existed but to no avail. Apparently that is something Koodo can't (won't) do anything about... and yes it's very annoying! Or turn off notifications for that chat in your texting app. 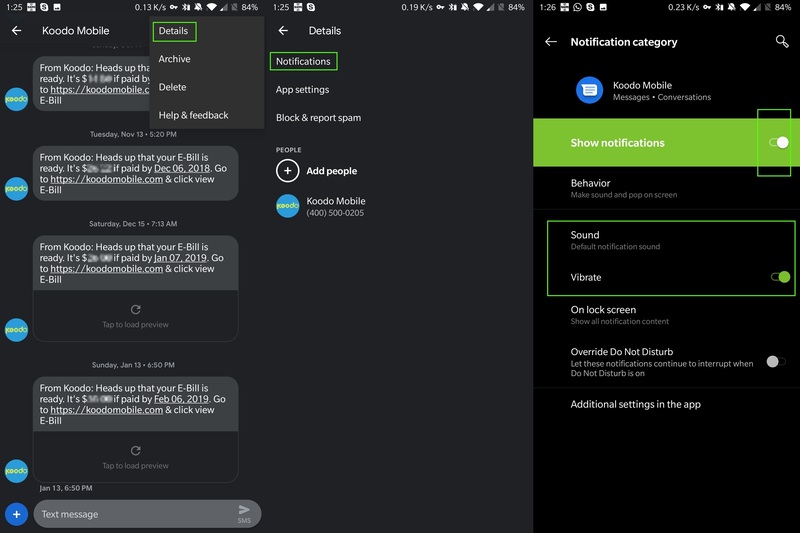 For example, in Google's Messages app, I open up the conversation for the Koodo notifications, then tap the "..." and choose Details, then Notifications, and I can either turn them off for that conversation entirely, or turn off the sound and vibrations, etc.